Sharon Hughes -- Al Gore Promoter of Doomsday Cult? AL GORE PROMOTER OF DOOMSDAY CULT? Okay, this picture is funny, but some take the comparison seriously. 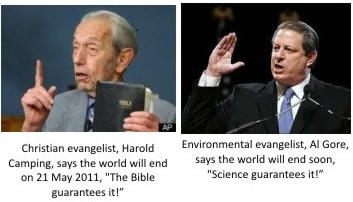 The Wall Street Journal had an article a few months back when Harold Camping predicted the end of the world would occur on May 21, 2011, called Camping the "Christian Al Gore." Why? Because the former Vice President is more and more being seen as part of a new doomsday cult that has grown out of the Green movement. While there are environmental issues we should be concerned about, as Marc Morano of Climate Depot pointed out on my radio show this week, some Green devotees are using the movement to promote a radical agenda that includes population control, and exploiting people of color in third world countries, insisting on putting solar panels on grass huts! "I was a little nervous this morning logging into Climate Reality...And, I have to say, my heart immediately sank, is Gore now a help or hindrance to global warming cause? I have suffered this torture too many times over the years...[Gore's show had] slide after slide of extreme weather events...& linking everyone, it seemed, to rise in [man-made] emissions...that is a very contentious peg on which to hang your hat..."
And two German scientists, following Gore's recent 'climate reality show' called his latest claims 'apocalyptic' and his 'promise of salvation' disturbing. A Cult: controls its members' beliefs & behavior; dictating what they accept as 'the truth', and who they associate with (only those who with the same beliefs); and strongly promote their leaders as having superior knowledge, and if you disagree with them you are labeled. "The challenge before the religious community in America is to make every congregation - every church, synagogue and mosque - truly "green" - a center of environmental study and action. That is their religious duty." Isn't it funny how leaders in the environmental 'doomsday cult' don't practice their own 'preaching'? Let's not forget that Al Gore has become a bizillionaire doing what he's doing to promote his man-made global warming theory. In May of 2010 Noel Sheppard at NewsBusters reported: "Nobel Laureate Al Gore purchased a $9 million mansion in the luxurious hills of Montecito, California, recently, and with the exception of the Los Angeles Times and Fox News, America's media couldn't care less. You think it might be because the Gore-loving press wouldn't want people to consider the possibility that all of his global warming hysteria was really about lining his wallet and not saving the planet." And remember what Gore, the Nobel Laureate, told Congress in 2009 as the House was deliberating cap-and-trade legislation? See Video. Al Gore is not alone in 'climate adherence hypocrisy' -- this movement is filled with elitists who expect everyone but themselves to follow their dictates. Who can forget the Climate Conference in Bali a few years back where environmental elitists all flew in on their private jets causing chaos? Here's the details just to refresh our memories. Well, I could go on and on, and I'm sure you could, too, but we'll leave it here for now. I've got to hop in my SUV and buy some charcoal for tonight's bar-be-que steak dinner. Al Gore is not alone in 'climate adherence hypocrisy' -- this movement is filled with elitists who expect everyone but themselves to follow their dictates.